A MINOR earthquake has scientists closely monitoring a New Zealand volcano that erupted for the first time in more than a century Tuesday. 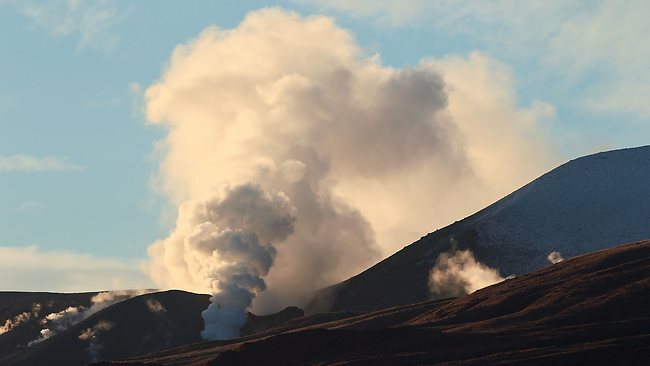 The steam-triggered eruption late Monday of Mount Tongariro on New Zealand's North Island sent boulders flying, covered surrounding areas in ash and disrupted domestic flights. Scientists were able to fly over the area for the first time today. Volcanologist Steve Sherburn says it appears the eruption blew three new holes in the north side of the mountain, including one about the size of a house. He says it's not yet clear what to expect next from the volcano, which continues to vent steam.